Rickenbacker Trail is considered one of the best places for biking in Miami. 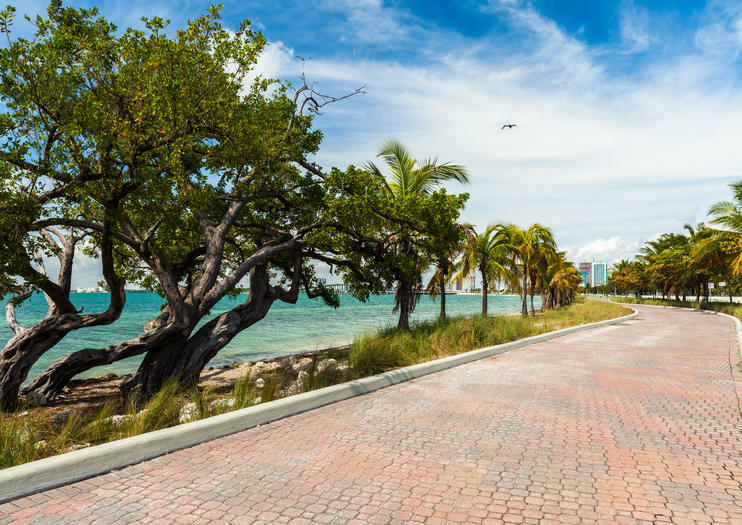 Spanning the entire island of Key Biscayne, the 8.5-mile path includes well-known spots like Virginia Key Beach, Crandon Park and the Miami Seaquarium, and begins in southern Miami before continuing south along Rickerbacker Causeway/Crandon Boulevard. There are picnic areas, coastal dunes and even an amusement center at the popular Crandon Park, which sits at the northern end of the trail. Visitors often snorkel, kayak and hike here, or visit the museum and historical lighthouse. Another spot is Bill Baggs Cape State Park, which includes one of the more low-key beaches along the trail. If you stop in Virginia Key, there are beverage, snack, and ice cream vending machines on site. Be sure to try smoked fish at Jimbo’s, a tiny restaurant shack that has earned quite a reputation. If you’re biking the Rickenbacker Trail, there is an option that adds approximately four miles to your ride if you turn at Virginia Key’s Arthur Lamb Road. If you are really adventurous, the trail combines with Commodore Trail, Old Cutler Trail and Biscayne Trail for a ride totaling around 27 miles. The trail is open sunrise to sunset, while most parks along the route close at sunset or earlier. There is parking at Crandon Park (6747 Crandon Blvd) and at Bill Baggs Cape Florida State Park (1200 Crandon Blvd). Bring water, sunscreen and protective clothing as necessary. Discover vibrant Miami and South Beach from the water on this fun water taxi through Biscayne Bay. With your all-day ticket, enjoy unobstructed views of the city’s bayside attractions and hop on or off at any stop along the way. Create your own Miami adventure! Delight in the glitter of Miami after dark on a 2-hour evening sightseeing trip! Cruise through town with a private guide, touring dazzling urban Miami and Biscayne Bay. You’ll hear colorful tales of the city from your driver, and glimpse Miami's colorful art deco architecture, skyscrapers, tropical flora, opulent mansions and pristine beaches by night. Make sure to get a keepsake photo of the twinkling city skyline!